Olive leaf extract is well known to help maintain a normal and healthy cardiovascular system and assist in the maintenance of normal heart function. While olive products are known for high concentrations of antioxidants and phenolic compounds, not all olive products contain the same concentration level. Of all olive products, only olive oil that is labelled as extra-virgin (acidity <1%) and olive leaf extract are considered superior sources of phenols. When comparing olive oil and olive leaf extract, it is the leaf extract that contains considerably higher concentrations of phenolic compounds - up to 40 times greater. According to one test conducted by the New South Wales Department of Primary Industries’ Agricultural Institute, olive leaf extract was found to contain 6360-8190 mg/L of phenol levels, compared to 200-800 mg/L in extra-virgin olive oil. As well as higher phenol levels, olive leaf extract also has the advantage of providing higher antioxidant levels without the high fat content of extra-virgin olive oil. 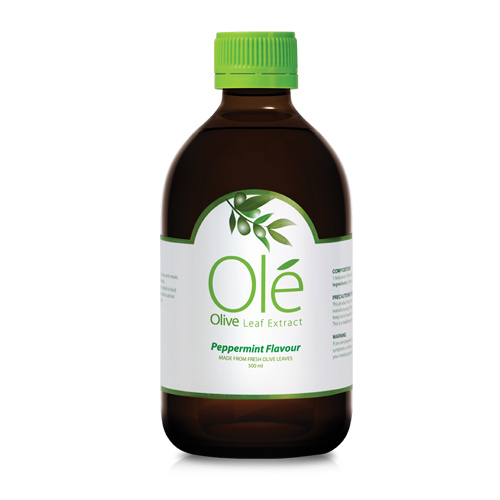 Why ‘pick’ Olé olive leaf extract? Whether it is the fresh-picked origin of the leaf, the history of expertise pertinent to the growers of Olé olive trees, or the branch-to-bottle processing… the reasons for choosing Olé are as wide as the benefits you derive from making that choice. International genetic bank: The olive trees used to create Olé are scientifically selected based on DNA identification and High-Performance Liquid Chromatography (HPLC) selection. The growers of Olé’s fresh olive leaves tested 60 different olive varieties from 12 countries to identify the variety that is most perfectly suited to fresh leaf extract production. Halal Certified: Olé is processed, prepared and packaged in a Halal-Certified Facility. Selected from the world’s best... Grown in Australia: Egypt, Morocco, Chile, France, Spain, Italy, Greece, Australia, Argentina, USA and Tunisia. Branch-to-bottle processing: Olé leaves are freshly picked during a sunrise harvest and then immediately processed and bottled, meaning there is no storage, drying, or damage of leaves. Using only fresh-picked, alive olive leaves: When the leaves that are used to create olive leaf extract are freshly picked, the potency of the extract is considerably higher in strength and is more readily bioavailable than olive leaf extracts reconstituted from artificially adjusted olive leaf extract powders or from dry leaves. The world’s largest olive leaf grove: 550,000 Olea europaea trees grown solely for fresh leaf. Natural properties maintained: The branch-to-bottle processing of Olé also means the natural properties of the olive leaf are protected and maintained, resulting in fresh, alive leaves that retain their full range of polyphenolics in a synergistic effect. Critical processes combined to ensure the highest quality and potency: The olive trees grown to produce Olé are only farmed naturally on virgin land using vermiculture (worm-created) fertilisers and pristine irrigation water. Up to 40 times more polyphenols than extra-virgin olive oil: The use of fresh olive leaves means a synergistic effect that retain the full range of polyphenolic antioxidants (not just oleuropein). Pure and natural ingredients: Olé contains no artificial flavours, colourings, preservatives, alcohol, sugar, lactose, starch, yeast, gluten, or animal products. 100% Australian grown: The Australian climate, prime agricultural soils, and geographical location make the country one of the world leaders in the cultivation of fresh produce.